Every lawn and garden has bugs. In fact, bugs are a necessary part of the ecology of a landscape in Loudoun County. Without them a landscape simply does not work. However, when bugs reach a critical level they can damage and destroy your lawn and gardens. This is why Property Services Landscape of Leesburg, Virginia recommends two applications of organic lawn fertilization to help control bug levels, such as the dreaded Japanese Beetle, and maintain the health of your lawn and garden. These applications can prevent infestation and alleviate insects that are already harming your plants. In addition to fertilization and insecticides there are natural ways to prevent bugs from becoming pest destroying agents in your lawn and garden. Simply selecting the right border plants, herbs and flowers can go a long way to deter bothersome insects in your Sterling or Ashburn lawn. Border plants, or plants that are planted on the border of your garden, act as a repellent to certain insects in your Loudoun Lawn and Garden. • Citronella: is commonly used in natural bug repellents and candles to repel mosquitoes and flies. The citrusy odor is unappealing to insects. When planted around patios, decks or swimming pools they can greatly reduce the presence of pesky insects. • Geraniums: are an excellent choice to repel Japanese Beatles and are safe to plant anywhere, even around vegetable gardens. They add a lovely pop of color and serve to confuse insects. • Marigolds: are also safe to plant anywhere and confuse insects much like Geraniums. They are particularly helpful to repel soil nematodes. • Wormwood: deters both insects and animals who like to eat your garden. Its strong sage-smelling odor is a natural repellent to insects and animals. But due to its toxicity do not plant Wormwood around vegetable gardens or areas where small children or pets play. Not only are these herbs helpful in deterring insects they can be easily clipped and used for cooking or balms. Flowers such as Petunias and chrysanthemums are also a good choice to use a border plants to deter pests and insects. 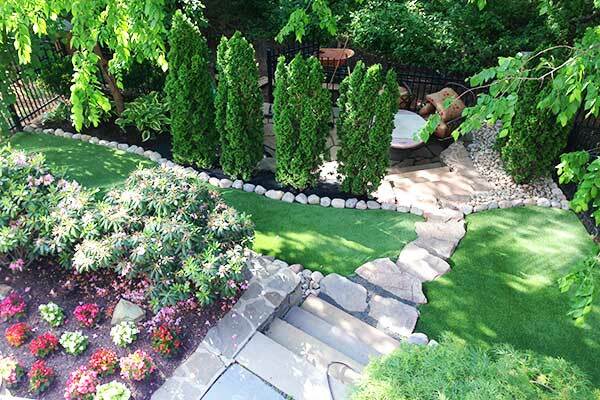 Learn more about our Turf Renovation Services here. More questions about how to reduce lawn and garden destroying insects and pests in your Loudoun Lawn? Contact Brain Wedemeyer, owner of Property Services Landscape today: http://propertyserviceslandscape.com/contact.